This is a 2-day project workshop with 2 weeks in between. You will have homework between class #1 and class #2. First session (4/13/2019, 10-5): Students will spend the day "glassing" their large 18" round substrate using a variety of materials in coordination with tempered glass. Papers, photos, text, foils, glitters, colorants, and everything in between! 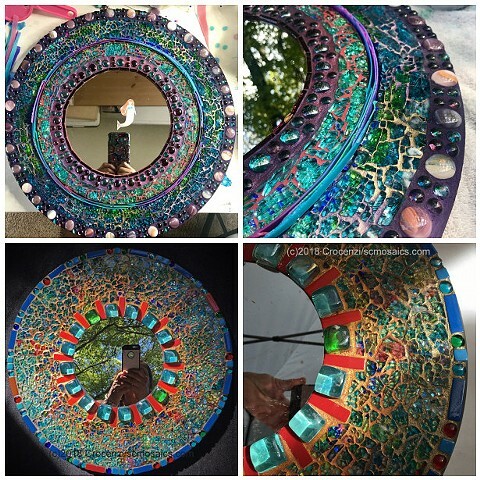 Tap into your creativity and human instinct to MAKE STUFF, a beautiful sparkling mirror that you've made specific to your tastes. At the end of class you will take your unfinished mirror + supplies to finish glassing in the next three weeks at home. (Approximate amount of time you'll need to devote to this homework: 4-10 hours). Second session (4/27/2019, 10-2): Students will spend the day using grout and grout colorants to finish off their mirrors. Price (includes all materials): 225. An example of what you will make in class!